Jen is gonna lose it! : BYOC! a day late..
It’s FRIDAY – which means it’s BYOC – Bring Your Own Crazy…around these parts. We answer a couple of questions to get to know each other better and to give our blog brains a break. Copy and paste to your own blog if you so desire…and ENJOY!! 1. If you could pick any name on Earth for yourself – would you change yours and what would it be? *Well being a Jennifer I think I always wanted a different name. I altered mine during the years. Geni is how most of my family addresses me. I love the name Tatum, Texas and Georgia. 2. If you’re a worker-outer…what time do you partake in such activities? There are SO many theories about when it’s best and not best to work out….like the morning is better since you have an empty stomach or the night is not good because you won’t be able to sleep…etc, etc. – so I’d like to hear your theories. * N/A lol before my schedule got all changed from going back to work and husbands appointments I had an alarm/reminder on my phone that goes of at 10:00am saying MOVE! GET UP! DO SOMETHING! That is when I would hike. Need to restart a routine soon. 3. If you drive a car – what kind is it and if you could drive any car – what would it be? 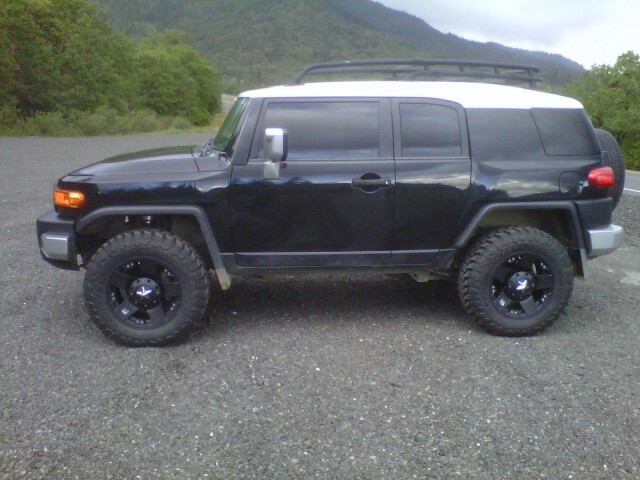 Currently I have a Toyota FJ cruiser. 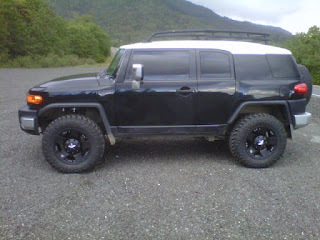 Total rednecked out with a lift and custom wheels. I love it. I had a GMC Denali prior and loved it too. If I were to buy again I would get another Denali. 4. Can you be totally honest in answering this next question and tell me what you think of tattoos? More importantly – what do you think of the people who have tattoos – specifically women? *I think its a personal choice. I like well done tattoos. My daughter has a really nice one on the cap of her shoulder (she has to hide it under her uniform) I'm not a fan of sleeves or neck tattoos on women. I want another one but I really want it to mean something to me but things keep changing so I figure it is best to wait. *Blog land has been a nightmare for me in connecting and commenting. I have tried a few different things and now it seems to have resolved a bit. I'm reading from my phone as I have been in various VA waiting rooms lately but not commenting. *Real life, what can I say without spinning into Debbie Downer mode. I had my 42nd birthday on Thursday. I spent it at a VA hospital. I have returned to work but am hit and miss due to existing appointments until July where I will be F/T. Feel out of control at the moment trying to settle into a daily routine again. My husband can't drive anymore as he is having seizures so I have been doing a lot of driving lately. Still plotting some sort of mini-escape soon. If not for real at least in my imagination! Happy late birthday Jen! I hope can get a real escape soon. Take care. Happy belated birthday! Happy, HAPPY. I so hope you're able to get a bit of an escape soon!!! Even for a few hours! Take very good care of yourself!! Aw...my friend's daughter is named Tatum and I think it is cute too. Hope things get better and you can find some escape real soon!